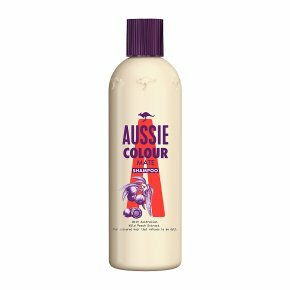 Our unique Aussie Colour Mate Shampoo formula, with extract of the yummy Australian Wild Peach, helps keep your coloured hair looking vibrant and in turn, brightens up your day. For better results, yep, you've guessed it, use with Aussie Colour Mate Conditioner. Dull just doesn't suit you. Our special formula keeps your hair as vibrant as you. It gently cleanses to help protect coloured hair. With Australian Wild Peach extract. For vibrant, coloured hair that refuses to be dull.You've got your colour looking fantabulous, so the last thing you want is for it to fade. Our special shampoo, with Australian Wild Peach extract, gently cleanses to help protect coloured hair so it can stay as vibrant as you. The indigenous Australians used to ground wild peach kernels to condition their hair. Clearly they were way ahead of their time, as we're using it hundreds of years later! Great minds and all that! Wet hair and massage in. Rinse out. For optimal results use with Colour Mate Conditioner. We don't like to do things by halves!